I have posted this ride for Team Fun at least once before, and considered it several times since the first time I tried out the route in January. Every time, the Santa Ana seemed to whip itself up just in time for the weekend, scaring us away from the ride. 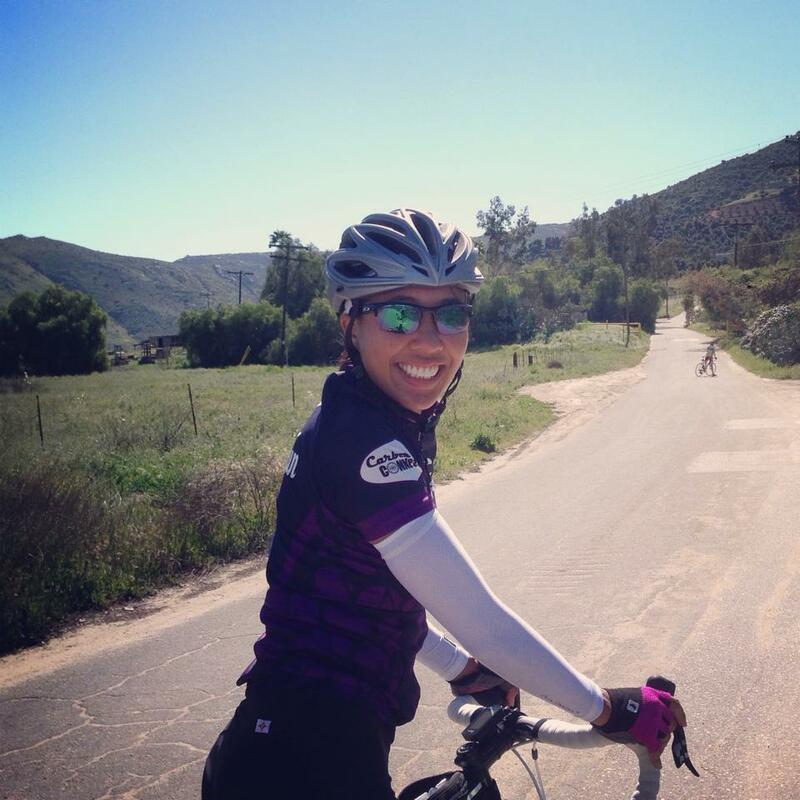 No one wants to be caught in a gale force wind on her bike, that’s for sure – but this ride is just too awesome to miss. I am so glad we finally got to do it! 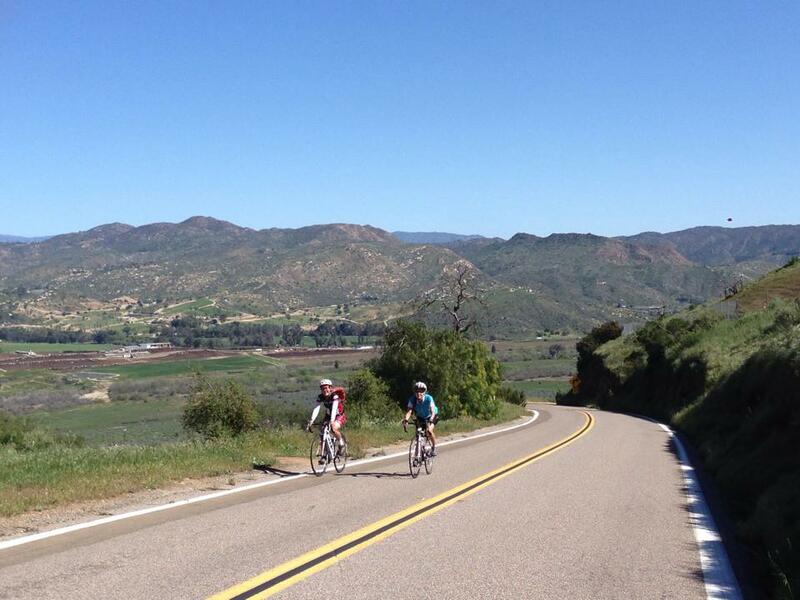 We had five riders starting out in the A/B group (soon to be six with Michell awaiting us in Escondido), and seven riders in the C group taking on a shorter but challenging route that headed out Del Dios and returned via Twin Oaks Valley Road. 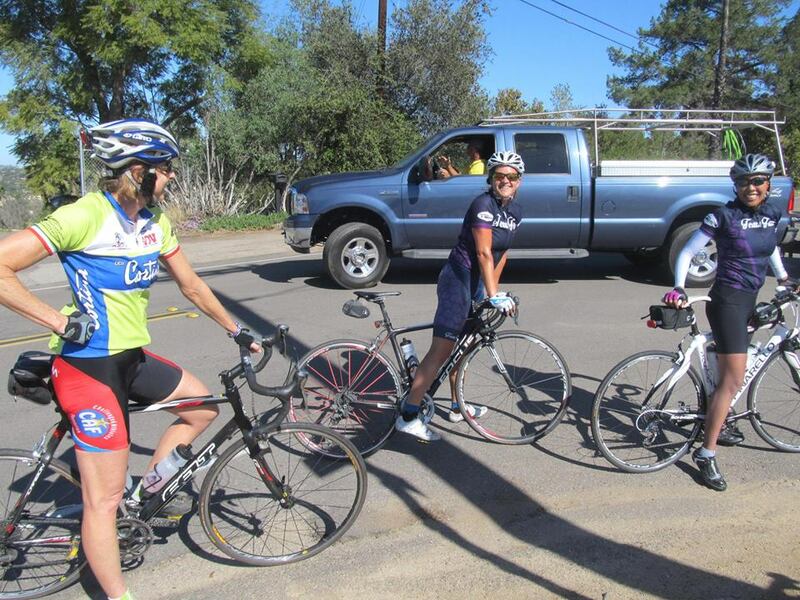 Huge kudos to the ladies of the C group for tackling Twin Oaks at the end of the ride! I will say that this group knows how to put the “fun” in Team Fun, with a stop at the Baked Bear Ice Cream shop to top off the ride. 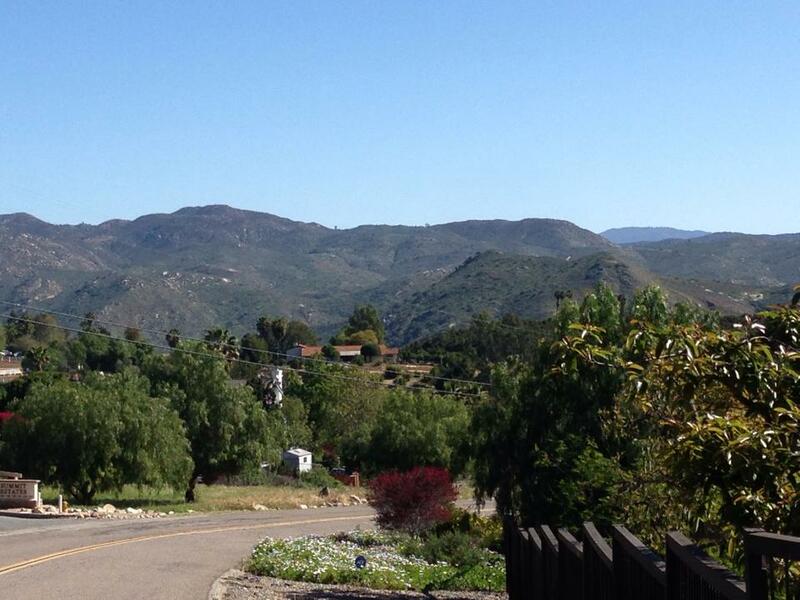 We started our ride out with an easy pace toward San Elijo and then out Elfin Forest/Harmony Grove toward Escondido. 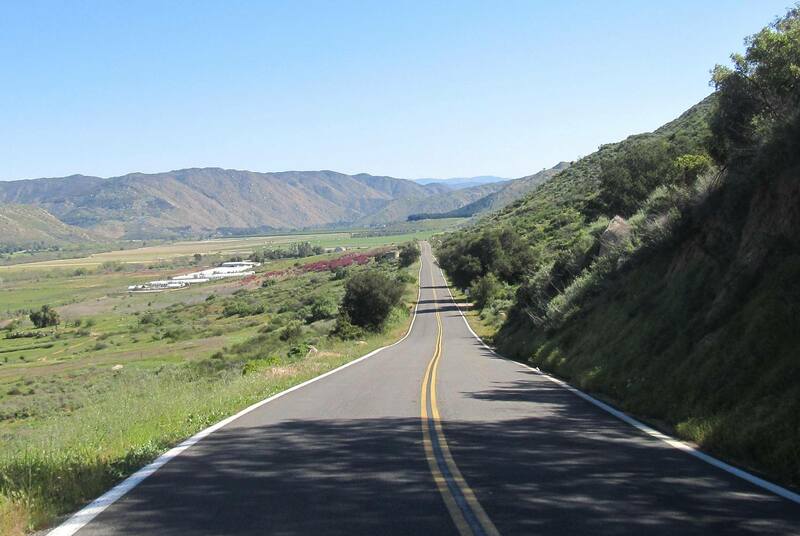 Instead of the typical turn onto Del Dios Highway, this route heads straight across on Citracado. This is where it gets interesting. In a few quick turns, you are suddenly in what feels like a much more rural area. The gate hopping spot at the top of Gamble Lane is always a great photo opportunity, and it lets you survey exactly where you are riding to. 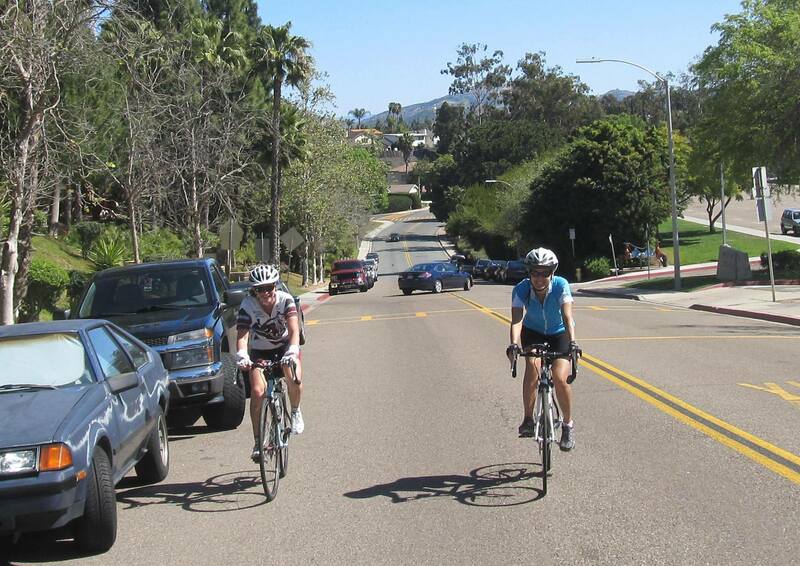 If you try out this route, I should tell you that you should enjoy the zoomy downhills on Gamble Lane and Felicita Road, because you pretty much won’t be riding much flat from here on out. 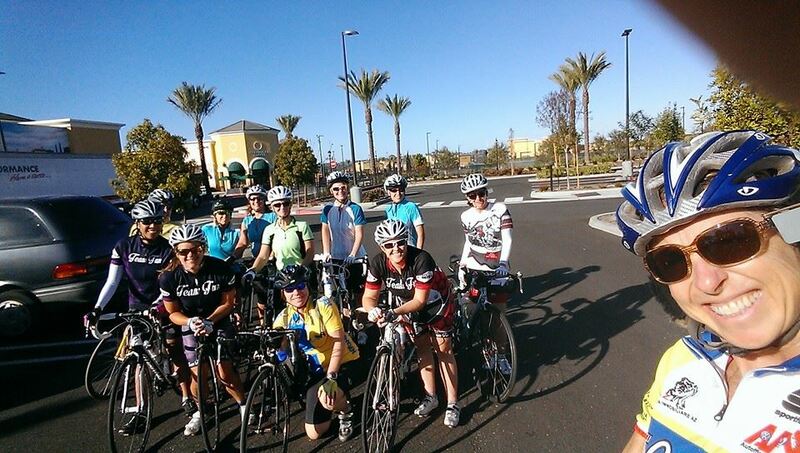 We passed by Lake Hodges and the mall area on our way over to the Mary Lane climb. 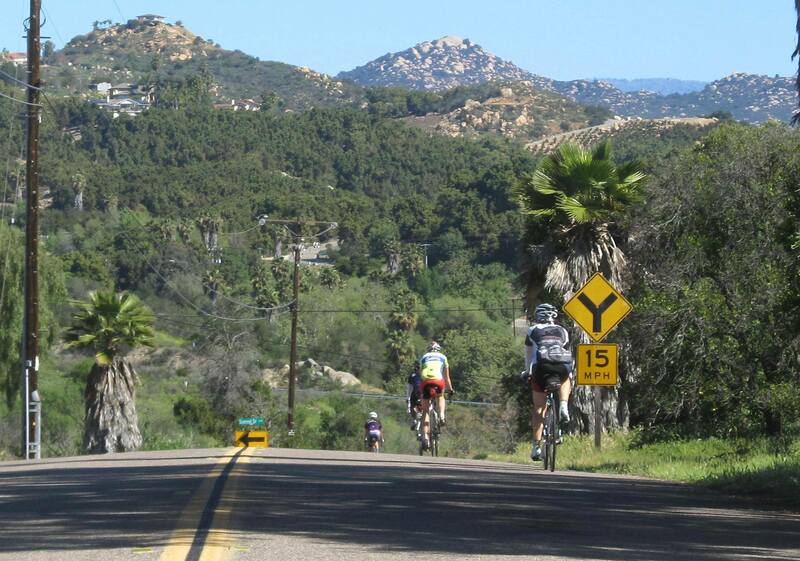 I added this climb into the route by the suggestion of member Judy L. in order to avoid the worst of San Pasqual Road – it’s a fairly long, grindy climb – but the views and traffic avoidance are certainly worth the diversion. We were definitely tempted by the mattress sale fundraiser going on at the local high school (more to see how exactly that was working out for them), but started up the hill in search of our sixth group member, Michell, who told us she’d be waiting to photo ambush us somewhere along the way. We hung around a bit chatting, but I kept warning them that this wasn’t the top! There was no danger of anyone getting cold while we were paused, given that it was probably about 80 degrees at this point, but I still wanted to get this part done so we could get to the good stuff – i.e., the descent into San Pasqual Valley on Summit Drive. I, on the other hand, have to full on stop to take pictures when I descend. 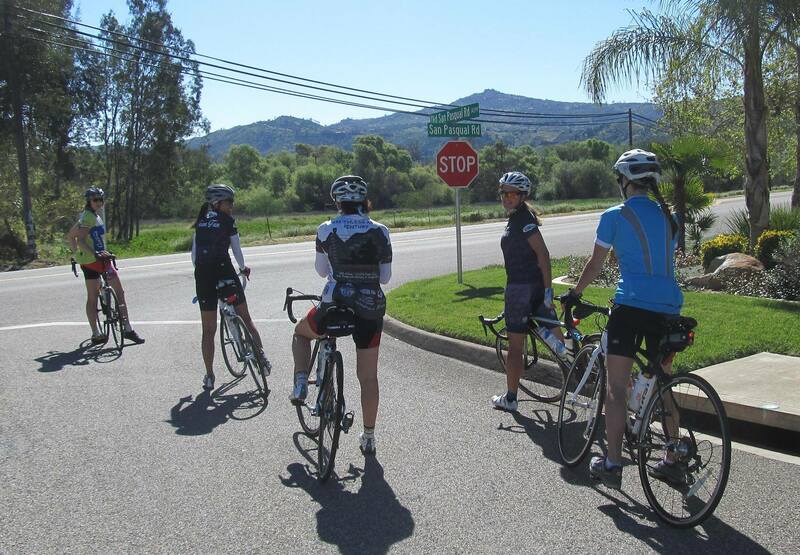 Brief snack stop, making sure everyone is fueled up for the climbs ahead. The route makes a brief sojourn on the ever-sketchy San Pasqual Road (maybe 200 yards), before quickly turning off onto the preferable Old Milky Way, which appropriately takes you right by a dairy farm. 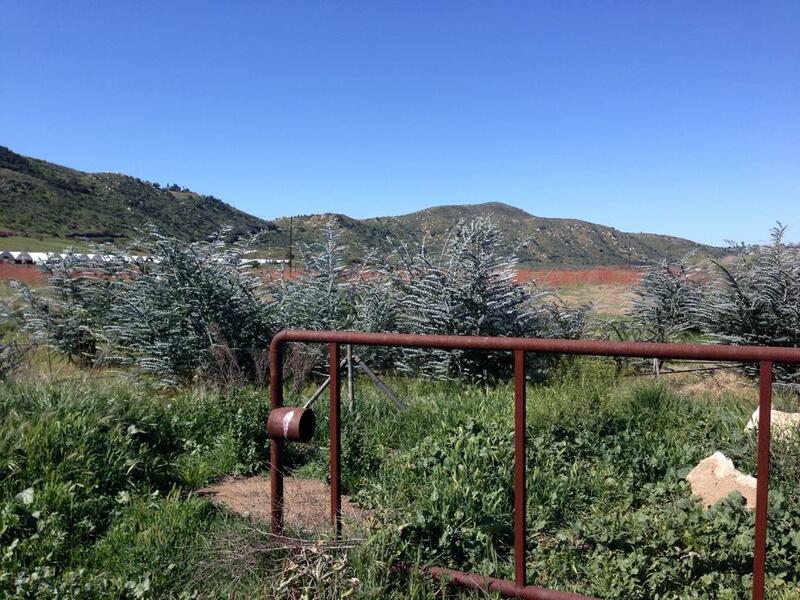 At the end of Old Milky Way, you get to try your hand at some off-roading, just for a little stretch on Santa Ysabel Creek. This is where the views explode – from the obviously elderly gigantic cacti lining the road, to the views of the mountains all around, this is a very special spot. It’s also where you begin the ascent of Bandy Canyon, which is deceptively gentle for awhile until the grade kicks up to more of the 10% realm for the last about 3/4 mile. If you make it out to Bandy Canyon, I suggest turning around when you reach the top and descending a little so you can take in the view (and the llama who hangs out up on the cliff to your right as you’re going down). I also suggest you ignore all and any suggestions from Michell to visit her “favorite roads” from this point – they are all hideously steep monstrosities that will make you strongly consider dieting and then leave you wondering if you have any energy left to make it home. Take my advice – you will need all the energy you have left to make it home from this point! It doesn’t really get any easier. Janice was very glad to make it through the dirt! Michell captured a great shot behind her as she ascended. 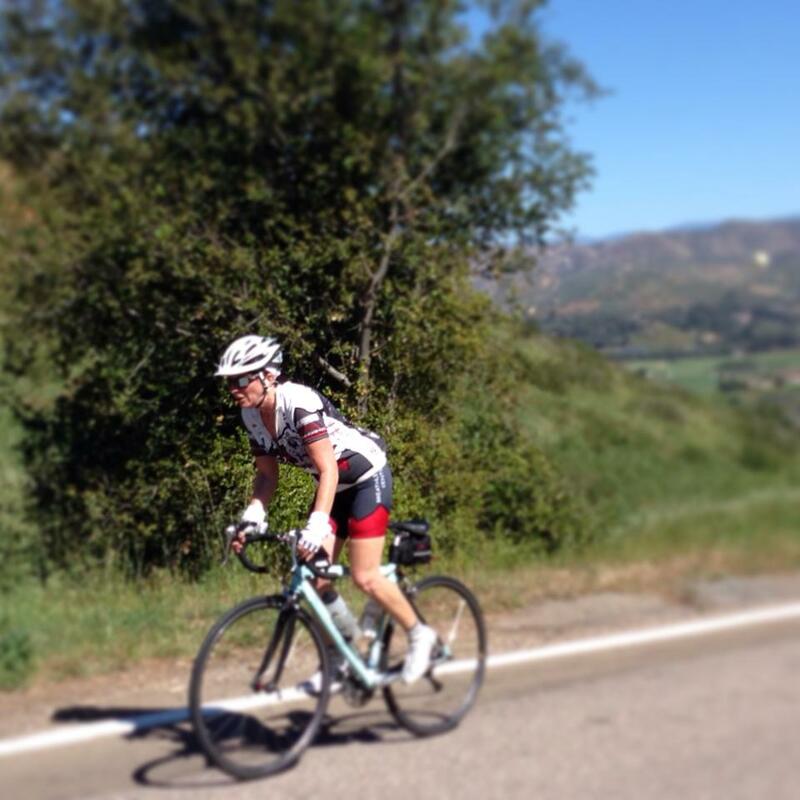 The remainder of the ride holds its own in terms of climbing and charm. 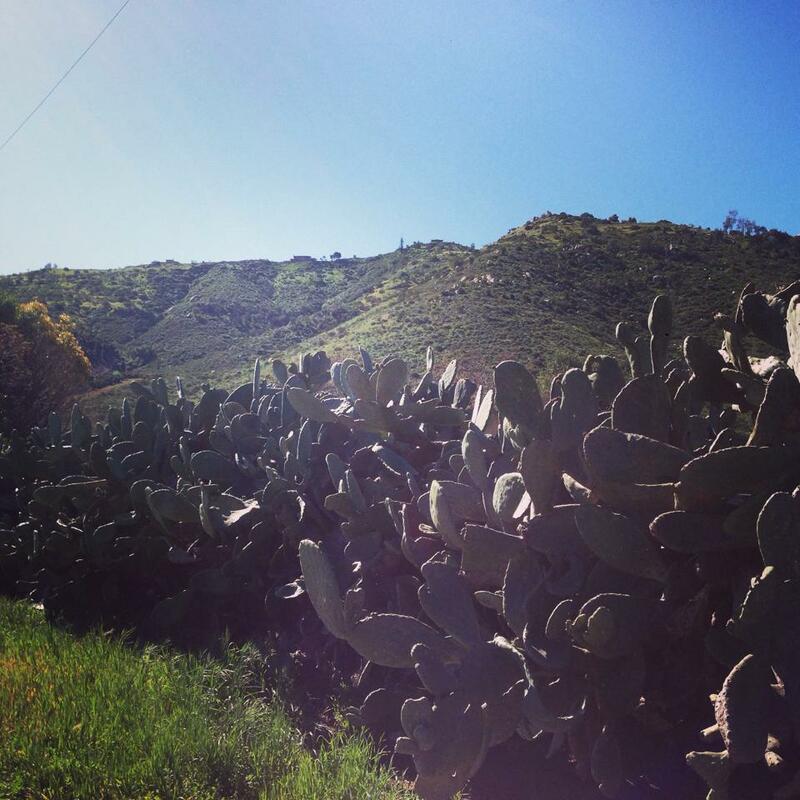 I can’t say I love the descent or any part of Highland Valley Road heading back toward Rancho Bernardo, although if you can take a moment to look at the nursery that’s at the bottom of the hill, that’s pretty cool. But mostly I’m usually worried about landing in a crack or missing a turn, and then there always seems to be a headwind out to Pomerado Road. 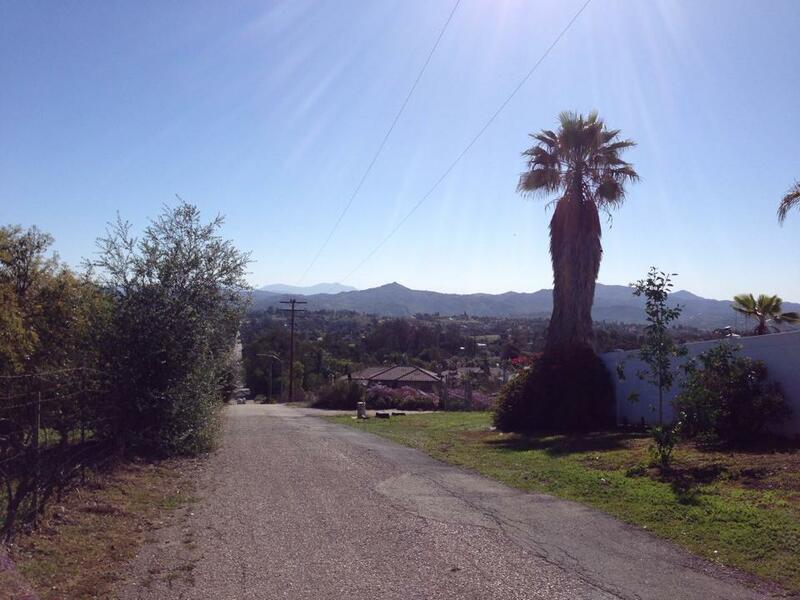 But once you climb up out of Rancho Bernando and make the turn onto Artesian, you’re back in magical country. Judy pointed out to me that there were many “No Outlet” signs on Artesian, but I assured her we would be able to get through (unless the water hadn’t receded… then it might get ugly if we had to turn around and ascend back out of the canyon). Alas, not only was there no water, a truck passed through the gate right as we came upon it and it was the first time I’ve ever been able to just ride right through and begin what might arguably be the worst climb of the ride… the dreaded Zumaque. Strava claims it’s about 0.5 miles and around 8-10%, but at 40 miles into the ride, it feels like maybe 1 mile and 15%. After that seemingly endless suffering, you’re pretty much home free (“Until the next hill,” as Judy pointed out so wisely). 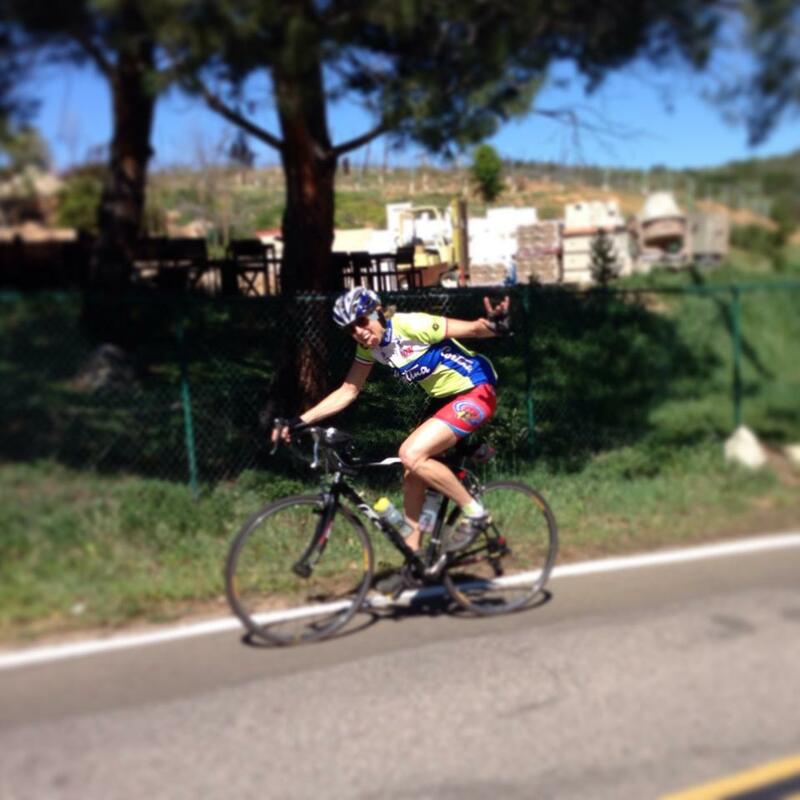 The ride was about 50 miles and about 4,000 ft of elevation gain. I’m feeling a little tired just reliving it. 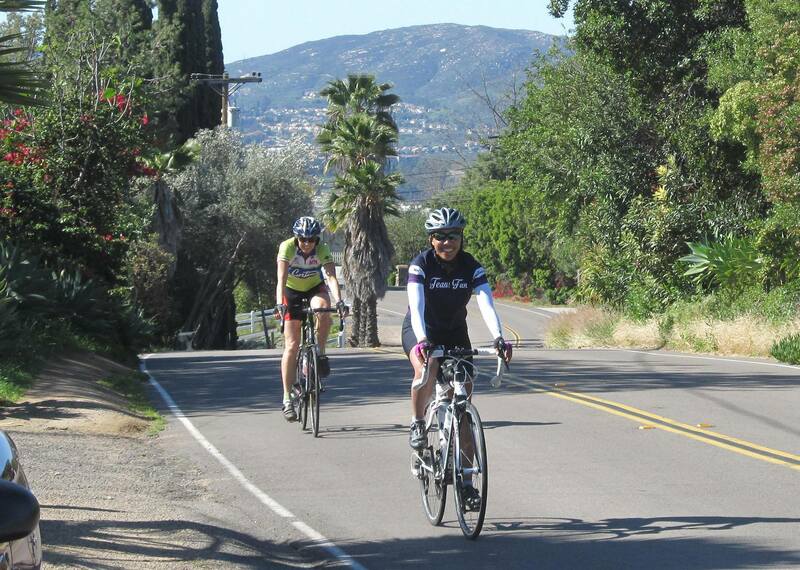 This Saturday the plan is to do something very different and head down to San Diego for another one of our favorite rides, the Coronado Ride – an entirely flat ride beginning/ending in De Anza Cove. We take the ferry back across the bay, and sometimes we’ve been known to sneak a Cold Stone treat while waiting for the ferry. hehehe, hopefully we’ll get to repeat this route again before the weather gets too hot (I could use a second chance at pitching some scenic side roads up around HVR 😉 It seems a couple more lovely ones off Eagle Crest just got paved! ).